In Italian-American families like mine, food is often equated with love. Many pet owners want to love their pets in the same way- with too much food. As a result, we have an obesity epidemic among our household dog and cat populations in America. Several times a day, I talk to my clients about putting their pets on a weight loss plan. 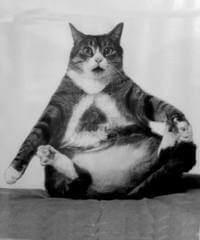 Chubby kitties may be cute, but they are at great risk for diabetes and arthritis. Rotund pooches face the same risks, particularly arthritis. 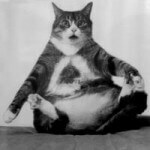 There are compelling medical reasons to keep Fluffy and Fido lean: lean pets have an increased lifespan, a decreased risk of cancer, a decreased risk of endocrine diseases like diabetes and metabolic syndrome, and a dramatically decreased risk of degenerative joint disease (arthritis). 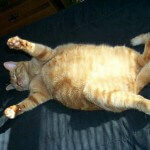 My clients frequently want to change their obese pet’s food. However, it’s typically not the type of food, but the quantity that contributes to obesity. Most of our pets simply don’t burn many calories in the course of a day, and can easily take in two to three times the amount they need. As I tell my clients, little things add up (particularly for little dogs). Since small dogs can sometimes be finicky eaters, clients often add “supplements” to dog food to get their pets to eat. One slice of cheese can contain 100 calories; that may be half your Yorkie’s or Chihuahua’s calorie needs for the day! The same goes for chicken, beef, hot dogs and peanut butter – items commonly added to small dogs’ food bowls. 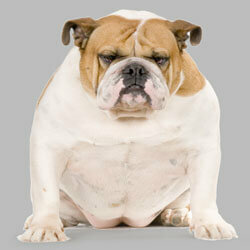 Overfeeding is simply the most common cause of obesity in domestic animals. 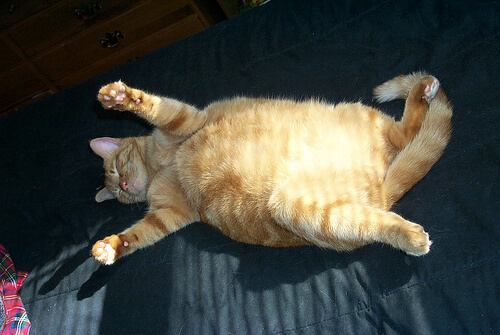 Complicating the overfeeding problem, most pet foods and treats do not contain calorie and fat information, as human foods do. Pet owners are completely “in the dark” about the amount of calories in the foods and snacks they are feeding, and how many calories are required by their pet to maintain a healthy weight. Typically, pet owners and veterinarians have to locate pet food calorie information online, by searching for the website of their pet food manufacturer. 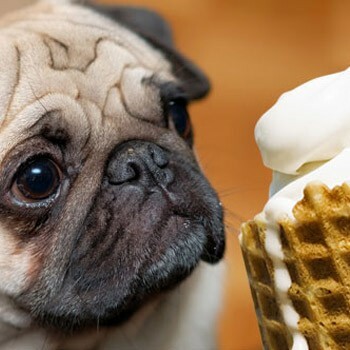 There are several formulas available to calculate Fluffy or Fido’s caloric needs. The most basic formula to calculate the Resting Energy Requirement (RER) for dogs in cats in kcal/day = 30(body weight in kilograms) + 70. Once we know Fido’s RER, and the number of kilocalories per cup of food, we can determine the exact amount Fido should be eating to lose weight. For larger dogs, they are often “food-seeking missles” and will search out any crumb or morsel in the house, even in the trash can or on the kitchen counter. For these dogs, preventing access to kitchens and garbage containers is a key to weight loss. For cats, most clients free feed. Cats and dogs do not have an internal censor to tell them to stop eating when they are full. The genetics of our domesticated pets harken back to ancestors in the wild, who needed to eat whenever food was available. Cats will frequently overeat if food is available all day long, so measured meal portions are often recommended for weight loss. Additionally, since cats are obligate carnivores (meaning they have no dietary requirement for carbohydrates), I often recommend wet food exclusive diets for my chubby kitties. Wet foods, regardless of brand, typically have a very high protein and moisture content, with limited to no carbohydrates. Dry foods tend to have many more carbohydrates than cats need, and it’s currently thought that may be a contributing factor to the obesity epidemic in felines. My kitty patients have had great success with weight loss on wet food diets, but transitioning a dry food addict to wet food can take patience and time! Finally, increased exercise and activity can also benefit our pets’ waistlines. Any additional calories burned will help with weight loss, but our cats and dogs cannot be expected to lose weight through exercise alone. Calorie restriction is most important, and additional exercise is just an added bonus. The good news about obesity is that it’s a health problem we can solve; the bad news is that it’s often difficult for owners to make the necessary reductions in calories since Fluffy and Fido can persistent beggars when hungry. It’s worth it to resist, however! The best gift you can give your pet is not another slice of turkey, but a nice, lean physique.